Previously on Survivor, the best player in the game was eliminated, which we suppose begs the question as to whether he’s really the best. We do perceive Christian as the best player in several seasons, which indicates that the other players aren’t just smart enough to recognize the threat, but also willing to band together to topple the king. So, now that we’re down to the final couple of hours, the best players remaining are Davie, Mike White, and Nick. If the three of them meet in the final, we’ll see three worthy candidates who also have the ability to argue their cases. Of course, Angelina will probably get dragged along instead, which means we’ll get to hear her talk about her huge sacrifice with the rice again. Sigh. Also, Alison and Kara are there. Probst pompously announces the beginning of the finale, thanking parents for letting their kids stay up late to watch the show. Aren’t most of them out of school? Or are we getting ahead of things? We waste a big bunch of time with a recap of what has happened so far. BUT it’s show we don’t have to recap, so that works out just fine. Especially since Angelina is the one to find the clue. She has to act fast – there’s a rock and a ladder. The ladder is bigger than she expects, and she sets it aside. While she’s in her crazy walkaround mode, she drops her clue somewhere. This means she MUST find it before someone else finds the clue. Honestly, we figure the producers will just drop the idol in front of her, but they don’t. She climbs on top of a huge rock, but there’s no idol there. She goes back to camp and cries, telling everyone that she fell off of a tree. She hopes they bought her story. 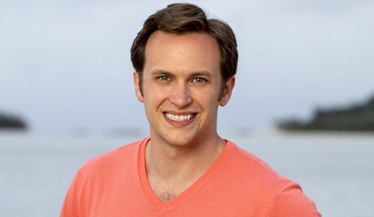 Thankfully, we leave Angelina and bring on… Probst. Great. It’s Immunity Challenge time, so we’re that much closer to a finish! Also, there’s a reward along with this immunity – spaghetti! Messy and likely to make them sick! Woo! The challenge begins with obstacles to hurdle. Then, contestants have to toss a ball at a target to release puzzle pieces. Kara and Davie are first to start working on their puzzle staircase, followed pretty quickly by everyone else except Alison, who hates throwing things. Why does everyone think she’s such a threat, again? With the staircase portion of the puzzle, everyone bunches for the most part. Kara gets it completed first, and now has to solve a final 60-something piece puzzle. Soon, Mike, Davie, and Angelina join her. Alison and Nick are playing from behind. You know what’s stupid to recap? Puzzle solving. Basically, Nick pulls it off despite a huge disadvantage. Obviously, he gets to choose someone to join him in reward. He picks Angelina, since she likes vegetables or something. Then, his second pick is Mike. Angelina’s clue is sitting on the ground somewhere. Maybe she’ll find it? While Nick, Angelina, and Mike eat their spaghetti, Angelina frets about the idol. They’re sitting by the water well, which is theoretically where the idol is. While they discuss voting out Alison, Nick and Mike idly (ha ha) wonder whether Alison has the idol. Angelina tells them about the clue and enlists their help. Side note: Mike suggests voting out Davie (he’s right – Davie should be the target). Nick shoots it down, because he can’t have the only other David voted out. Anyway, Mike finds the clue and immediately (after muttering under his breath how stupid Angelina is) points her to the proper location. She brags about how women rarely find idols. She is the best ever! No, really! Suffice to say that Angelina’s perception of her abilities doesn’t match up with our perception of her abilities. She’ll totally misplay this stupid idol. Just you watch. Next, she goes to Alison and tells her that she has “driven” the last three votes. Was she wearing a Mike White skin suit? Angelina suggests that maybe they should vote for Davie. Meanwhile, Mike White suggests to Kara that they should vote out Davie. Kara (correctly) notes that Mike White has been “driving” the last several votes. “Angelina has a big ego. She’s a Goliath. The more I make it feel like this is her decision, the more likely I’m gonna get her to do what I need her to do.” He’s not wrong. Clearly, he’s made her feel like she’s been driving the decision for a few Tribal Councils now. Anyway, Mike gave his word that he’d vote for Alison, so it really just comes to whether he has convinced Angelina that she has had the brilliant idea to eliminate Davie. Probst asks about the potential bootees this evening, and Angelina hems and haws about a bunch of names being discussed. Alison calls her out on that and says that it comes down to her and Davie. They were the only two to have received votes in the previous Tribal. Alison clearly has no patience for Angelina. Davie actually has a great comment where he notes that as the numbers get smaller, people get closer. Thus, a blindside stings that much more when it happens. That’s smart and intuitive. Mike is keeping a close eye on Angelina. He really doesn’t want a tie here, so he’ll need to tread carefully. And he’s controlled it perfectly. Davie is eliminated, leaving Nick as the primary challenger for Mike’s million dollars. As he leaves, Davie says that he’s giving his vote to the person who orchestrated this vote. Mike says, “I orchestrated it!” (Davie knows.) Angelina frowns. Be careful, Mike. Back at camp, Nick is really upset. He whines at Angelina that he thought they had a deal, but he blames Mike, not her. Alison and Kara say Nick is “like a child.” Since Mike fears Nick might blow things up, he admits that Nick probably does have to be the next target. Side note: Nick and Angelina talk about how Alison is totally going to win if she makes the final. What game have they been playing? Seriously. Hey, hey, it’s Immunity Challenge time. Survivors stand on top of a perch on a platform. They have to reel in a holey bucket full of water to pour into a tube. A key will rise as they get water in the tube. After they get the key, they have to dive into the water and go to shore, where they’ll unlock puzzle pieces that will come together for a block puzzle. Alison is done first, followed by Nick and Kara. Mike isn’t too far behind despite being way behind. Angelina is struggling. Surprise. Nick is methodically working his way through the puzzle. It’s like no puzzle at all. He wins easily. Is it finally Alison’s night? Or will Nick/Angelina wise up and get rid of Mike? If they do, we’ll have actually seen a situation where the best players (Davie, Mike, Christian) were in fact eliminated so that crappy ones can play in the final. Good lord. What if it really is Alison versus Angelina versus Kara. Ugh! Angelina’s big plan is to “create an epic Tribal Council!” She plans to have the girls vote for her so that she can play her idol for herself correctly! She tells Mike and Nick about it, and they’re utterly perplexed. Kara sees this as an opportunity to vote for Mike. She goes to Alison and tells her EVERYTHING Mike just told her. They figure they can vote for Mike if they can get Nick to join them. Basically, Nick and Kara decide tonight’s bootee. Mike might have overplayed his hand. Alison “finds” the Angelina fake idol. Angelina all but tents her fingers Montgomery Burns style. Also, did you know she totally sacrificed her chance at immunity so the tribe could have rice? Oh, well. At least she’s about to look super dumb. The finale hasn’t been edited in her favor. At Tribal Council, Nick admits that he whined like a baby after the previous Tribal Council. Angelina patronizingly says that she explained her position to him, and they made it up to him. Alison boringly blah blahs something. Angelina talks about her feud with Alison, which I’m not sure Alison was aware of until this moment. Kara rolls her eyes. Mike shakes his head.